Happy Valentine’s Day! As a present to my sweetie for an awesome day, I made one of his favorite desserts: Pretzel Jello Salad! Now, the family recipe I have is for Strawberry Pretzel Jello Salad, but I have created my own version, Peach Pretzel Jello Salad. That’s the wonderful thing about this recipe, though; you can really do any variation of fruit and Jello! 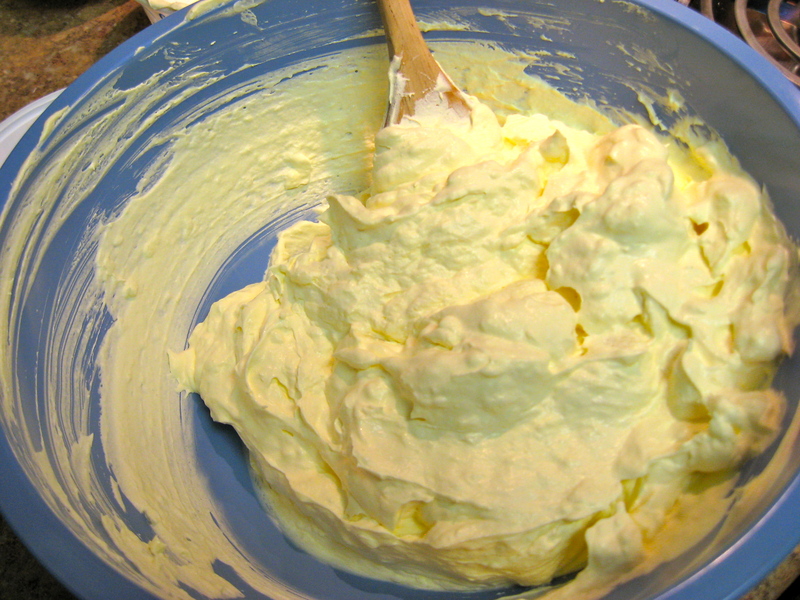 First, get the cream cheese out and put it in a mixing bowl to soften. I always forget to do this! Don’t forget to do this, unless you really enjoy softening the cream cheese by creaming it for five minutes. Hand cramp, anyone? 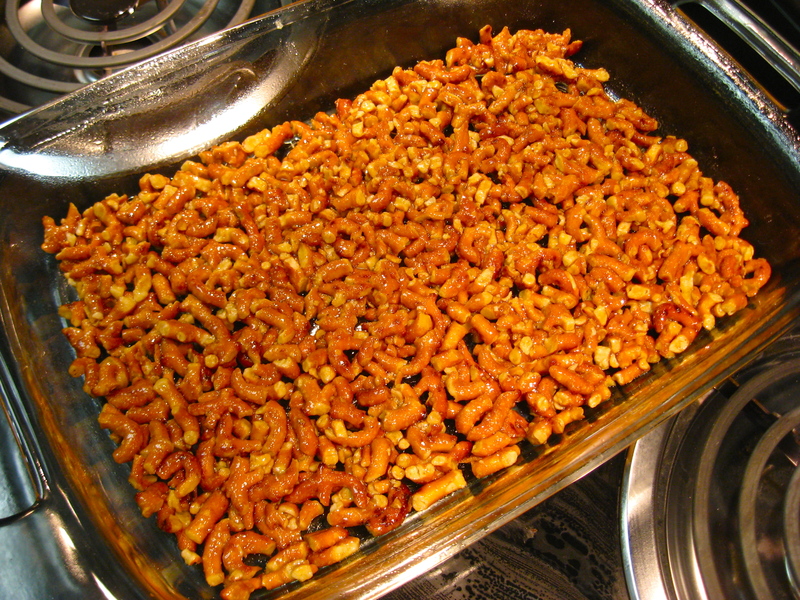 Crush the pretzels into small pieces, add in the sugar, and then pour in the melted butter. 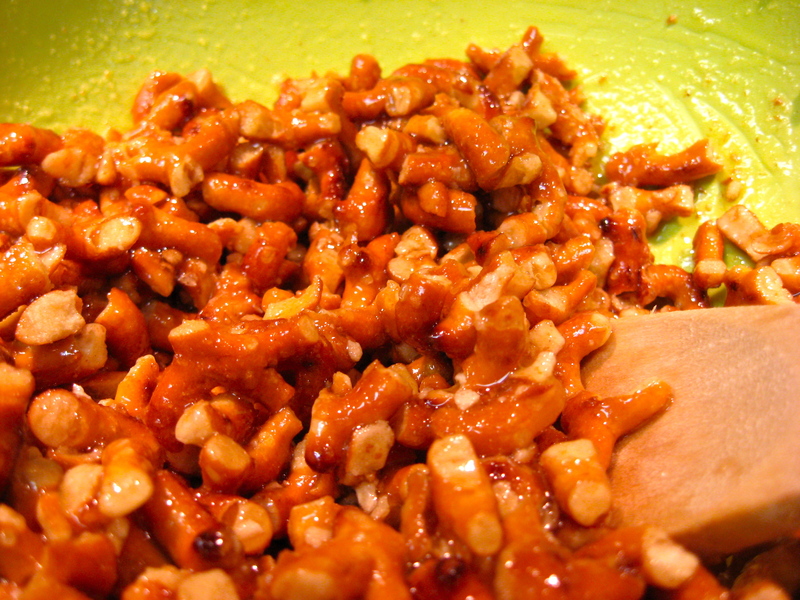 Stir until the pretzel pieces are well-coated in sugary goodness. Cook at 350° for 10 minutes. Let it cool completely (no refrigeration) before putting on the next layer. Let me just say, this crust is to die for. If this came in candy bar form, I’d be in trouble! Combine the sugar and cream cheese first. Once they are well-mixed, fold in the Kool Whip. When the pretzel crust is cool, spread the cream cheese mixture over it. Make sure to seal the edges of the dish; this prevents the jello from seeping through the layers. To make Strawberry Pretzel Jello Salad, use 20 oz of frozen strawberries from the freezer section and Strawberry flavored Jello. 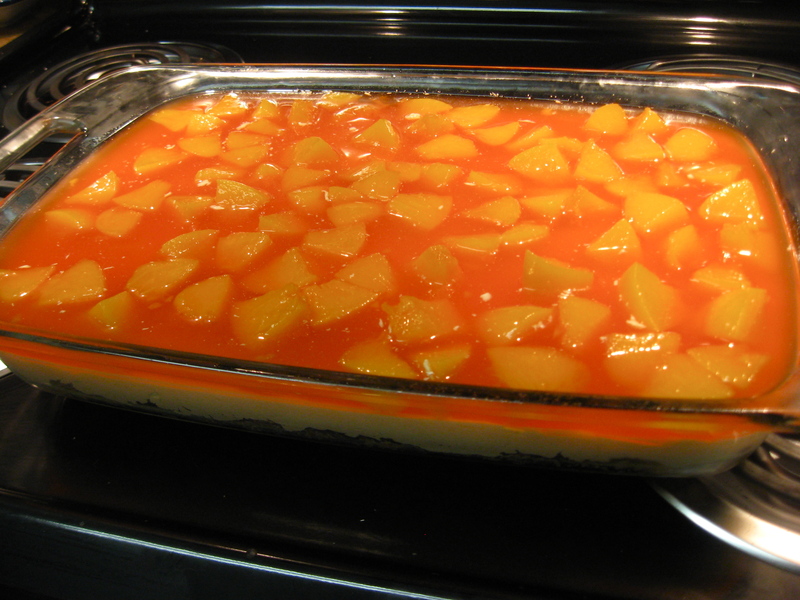 For my Peach version, use two 15 oz cans of sliced peaches in lite syrup and Peach flavored Jello. Drain all the liquid from the peaches and cut them into bite size pieces. Then, let them sit in the freezer while you prepare the rest of the Jello layer. Microwave the pineapple juice for about 3-4 minutes. In a large mixing bowl, combine the hot juice and Jello. Stir until dissolved. Then add the chilled peaches (or fruit of your choosing). Depending on how the Jello sets, you may need to pop the bowl in the refrigerator for 5 minutes. 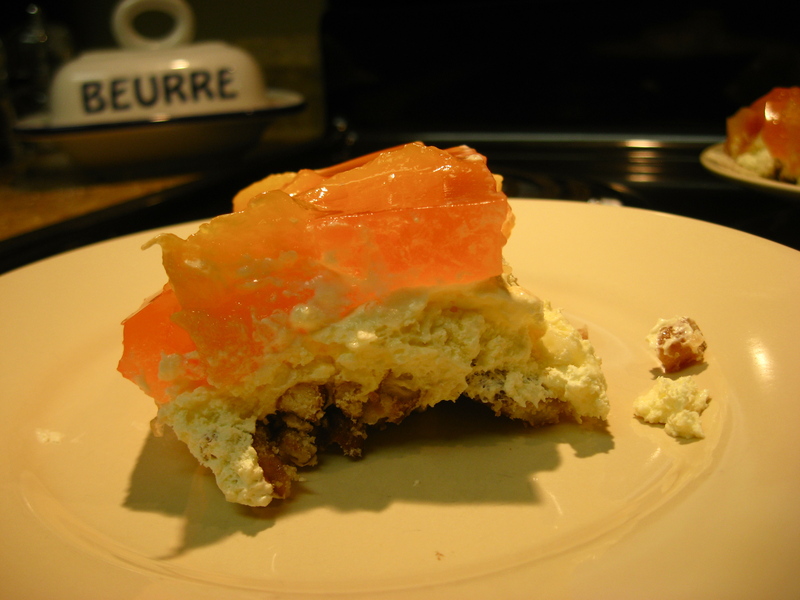 When the Jello starts to thicken, pour over the top of the cream cheese layer. And make sure the fruit pieces are evenly distributed across the top. After that, it’s the waiting game! Let the dessert set in the refrigerator for a few hours. Cutting the slices is a bit of a wrestle because of the caramelized pretzel crust, but it is soooooo worth it! And it may not come out pretty, but your taste buds won’t care! Hi, do you use salted butter or unsalted. Also can I leave out the peaches? I am not a fan of fruit in my jello. Also does the pineapple juice change the flavor of the peach jello? Thank you so much it looks awesome! I want to make this tomorrow for a family get together.